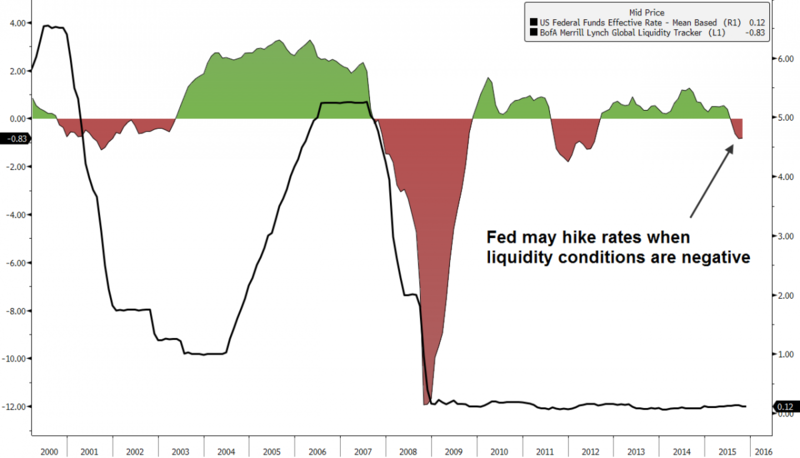 Liquidity Crunch - Is the Fed Hiking Rates at the Wrong Time? Given Felix Zulauf's recent comments on our show that the Fed is about to make a major policy mistake by hiking rates at the wrong time, we decided to take a look at BofA Merrill Lynch's Global Liquidity Tracker overlaid with the Fed funds rate. As you can see below, in the past two rate cycles (the data only goes back to 2000) the Fed raised interest rates only when global liquidity was positive and, conversely, lowered when global liquidity became negative. With the BofA Merrill Lynch's liquidity gauge now in negative territory, it appears that Felix may be correct that the timing is not right for a fed rate hike. Our real-time Global Liquidity Tracker (GLT) is a composite indicator of liquidity conditions in emerging and developed economies. To estimate our GLT indicator, we employ a dynamic factor model used by global central banks. Our Liquidity Tracker extracts a common unobserved factor reflecting the greatest common variation among market spreads, asset prices, monetary and credit data across different frequencies. We combine our US, Euro area, Japan and EM Liquidity trackers into a global composite using financial weights reflecting the average relevance of an economy in terms of market capitalization and private sector credit. All of this allows us to produce timely estimates of liquidity conditions in an effort to asses the state of the global economy. A reading of zero indicates liquidity at its long run average while activity between -3 and +3 represents the standard deviation from this average.